Use these crafty cord management solutions to resolve your wire woes and stay plugged in. Does your enthusiasm for electronics have you living in a jungle of cords? 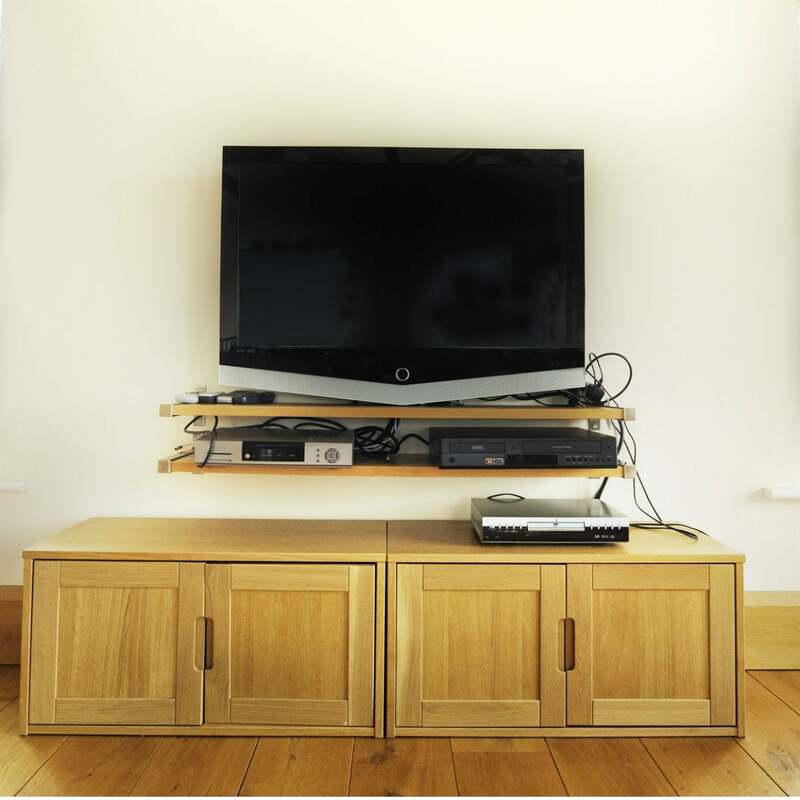 Given the sheer volume of wires that dwell in a modern home, figuring out how to hide TV wires and cords and cables for other must-have gadgets can be frustrating. But before you hit a point of swearing off technology altogether, check out the cord management solutions below. You can buy or DIY to disguise or hide every wire in sight and permanently improve the organization of your home. If you’re feeling a bit craftier, you can hide a tangle of cables behind a stand-mounted TV by incorporating built-in cord storage into the design of your DIY TV stand. 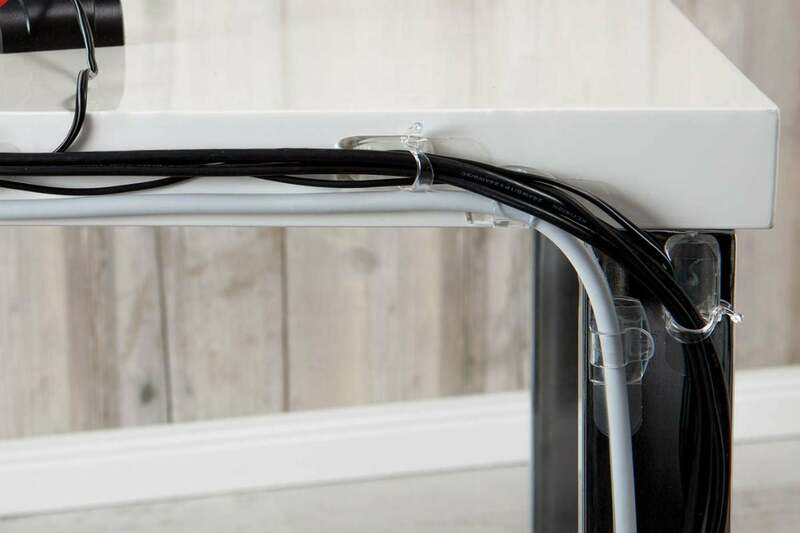 This one designed by Heidi from Kruse’s Workshop (and featured on Tatertots & Jello) keeps cables contained in a notch that runs down the middle leg at the back of the unit. You can recreate the stand from scratch with reclaimed wood: Follow the blogger’s detailed instructions for how to use a table saw to create a recessed groove in the back leg, then run the cords for your TV and other entertainment essentials down the groove in the leg to keep them out of sight. 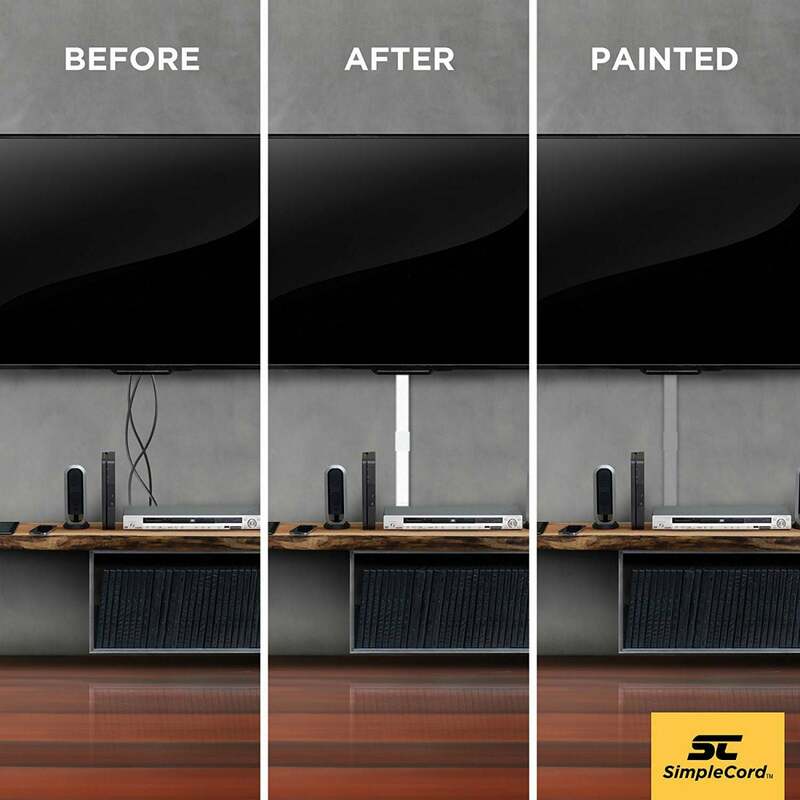 If the cords dangling from your wall-mounted TV are distracting you from what’s on screen, conceal them with cord covers (e.g., SimpleCord Cable Concealer Kit, available at Amazon). Plastic tracks like these mount directly to the wall on top of wires. To install and effectively hide TV wires, measure the span of wall between the base of the screen and the floor—that’s how the length of cord cover you need, and you can often cut to fit. In the case of the Cable Concealer Kit, you’ll cut the base and top of the cord cover using a hacksaw. Then, mount the raceway base to the wall with screws according to the manufacturer’s instructions, lay the TV cords inside the channel, and snap the cover in place over the top. Cord covers are typically sold in neutral colors like white or metallic gray that can stand out if your wall is a different color. 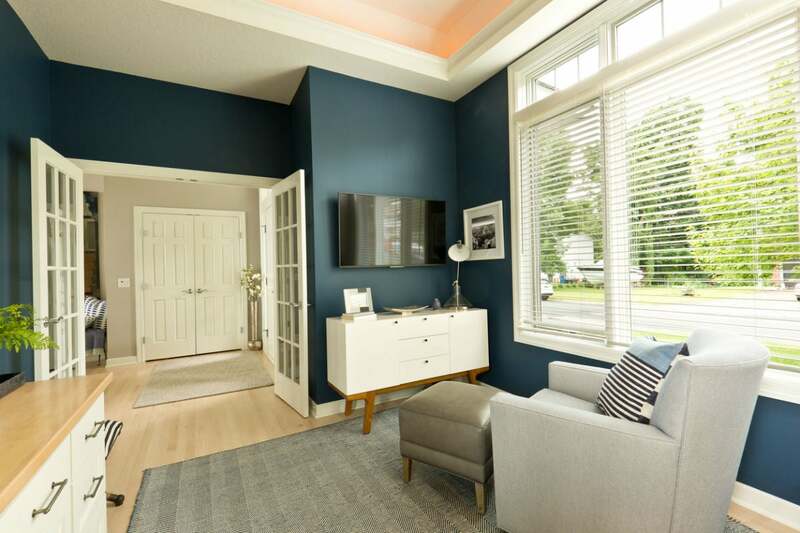 But when painted the same color as your wall (using latex-based paint), they seamlessly blend into the space. The best solution for keeping the cords of a wall-mounted TV out of sight involves hiding them behind the wall itself using recessed cable plates (e.g., Datacomm Cable Organizer Kit, available on Amazon). Remove the TV from the wall (or move it aside if your TV has an adjustable arm), and then use a stud finder to find two stud-free sections of the wall: one behind where the screen would sit, and another further down the wall near an outlet. These are where you’ll make your cuts using a utility knife, fit two cable plates, and feed the TV cords in and out of the wall. Your guests may just mistake your new media setup for a wireless entertainment system! Can’t manage the melange of cords in your home office for PCs, monitors, phones, printers, and other devices used daily? 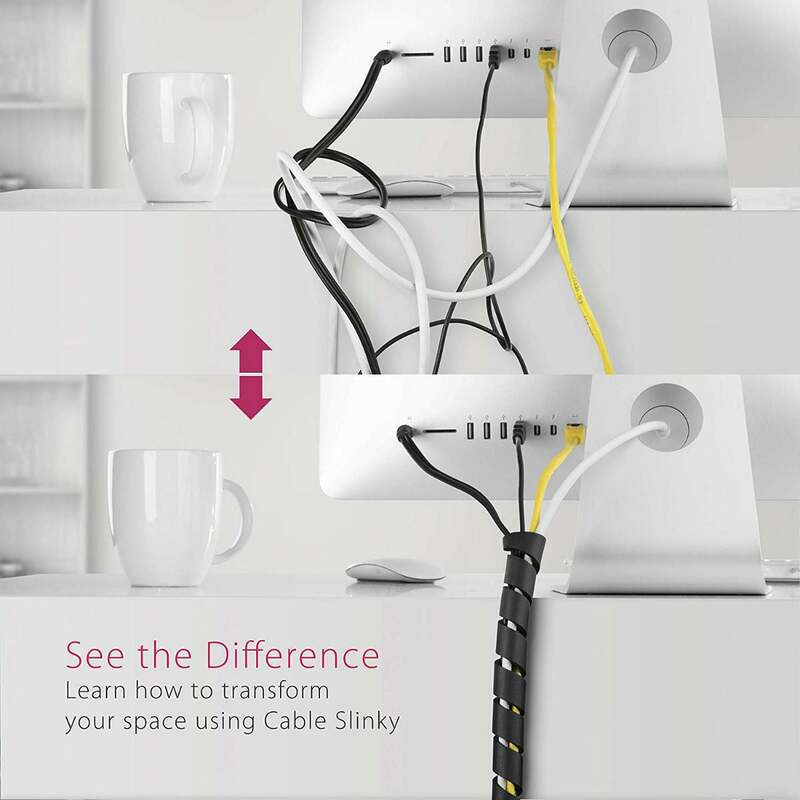 A cable wrap (e.g., Cable Slinky, available on Amazon) provides an easy way to consolidate all the loose cords that dangle from your desk. Simply bundle them together in your hands, and wrap the two-foot-long pieces of flexible foam tubing around the wires to corral them into one larger one and minimize chaos. Thanks to the slinky shape, you can break out and redirect wires from the group anywhere along the stretch so that they can reach exactly where they need to go. Making a few creative modifications to a desk drawer can do away with the eyesore of a clunky power strip parked on the floor and overflowing with cords. With a hole saw bit attached to your power drill, drill a hole into the back panel of the desk drawer located near a wall outlet. Then, feed the power strip cable through the hole and use double-sided adhesive to mount the back of the power strip itself to the same drawer panel. As you plug electronics into the power strip, create a space for each gadget to rest while it charges in the drawer, just as home blogger Jenny Steffens Hobick does in her kitchen cabinetry. 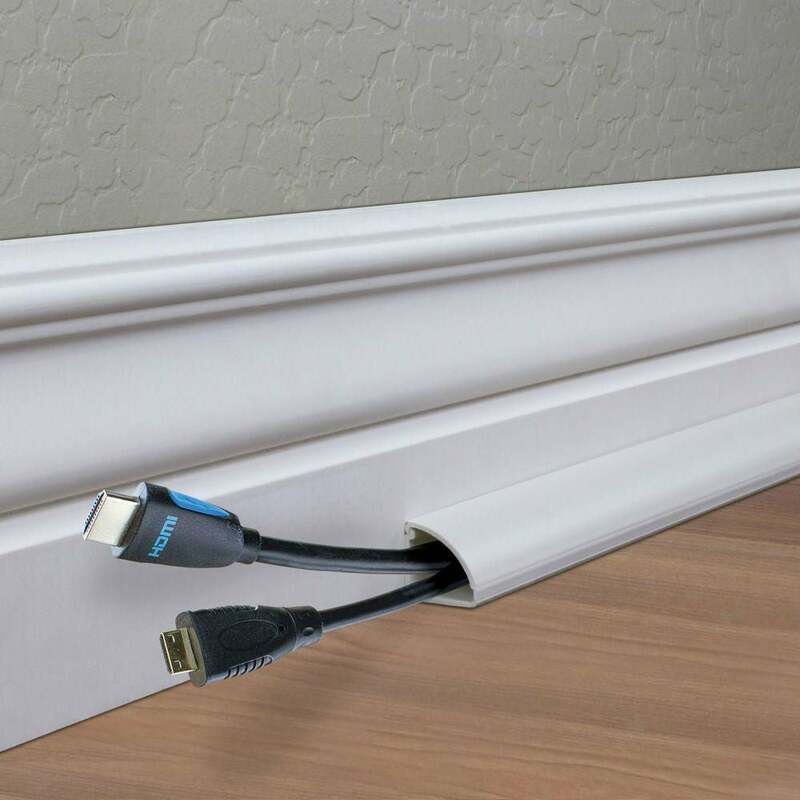 Eliminate the tripping hazard of an ethernet cable running the length of your home office, living room, or bedroom by adorning existing baseboards in the room with baseboard cord channels (e.g., CE Tech Round Baseboard Cord Channels, available at The Home Depot). The self-adhesive, impact-resistant cord channels are little more than hollowed-out sections of plastic quarter molding. To mount the channels to your baseboards, peel off the adhesive backing of a channel, press the back of the channel against a baseboard, and then run an ethernet cable—or any other cord, for that matter—through the opening in the channel to simultaneously hide and protect the cables from damage. Stainable and paintable, the baseboard cord channels can be dressed to match any interior design aesthetic. Your router or modem (or router-modem combo) can appear out of place almost wherever you fit them, but especially so on your shelves. Consider bookending your home library with a DIY router cover using this tutorial from BuzzFeed’s Nifty team. Grab a binder that’s wide enough to fit your router and use hot glue to cover the back, front, and spine of the binder with colorful scrap fabric, or better yet, the real jacket of an old book. Slip the router upright inside the binder, then sandwich the binder vertically between some books on an end table, desk, or shelf so that the router cables discreetly run down the length of the wall behind the furniture. Voilà! An instant classic that cuts cord clutter.